1. DO NOT VISIT Rome in the summer. It is hot and overcrowded with tourists. You will be stepped on in Piazza Navona and Fontana di Trevi, you will stand in long lines outside the Vatican and you will for sure get your wallet stolen. Whenever I have been to my national Consulate, I invariably met some of my fellow citizens desperately asking for an emergency travel pass. Their wallet and documents had been stolen without them noticing, so skilled pickpockets are in Rome. Staff at the Consulate told me that it has become their main activity. Everyday, they receive dozens of families reporting stolen passports and wallets. 2. IF YOU HAVE TO (visit in summer), get up at dawn and walk around the city. You will have it to yourself, you will enjoy the Fontana di Trevi in its full glory as it is unveiled by the rising sun, you will experience the blue morning light that makes Rome so distinctly beautiful, and you will be the first customer when the cafés open. Then go back to bed or to the beach and go out again after 10pm. You will have the reverse morning experience to close your day in style. 3. YOU ALWAYS WANTED TO visit the Sixtine Chapel? Well, you’re not the only one! Some five years ago, I would have advised to go there at lunch time when all the other tourists are having lunch, today, it is packed at any time of the day. Pre-booking a ticket online is probably the best bet to avoid the endless queues, but it will still be unbearably full inside. Those who can afford it cand have the luxury of booking of a private tour at night. 4. GO FOR SMALLER galleries. One of my favourites is Galleria Borghese in the park of the same name. It used to be a private residence at the time of the Papal nobility, so it is of human scale and more enjoyable for that very reason. It contains some great art spanning centuries, from ancient Roman mosaics to Bernini sculpture and Caravaggio paintings. Pre-booking is required as they only let in a small number of visitors, which is what makes it so much nicer. 5. FORGET YOUR GUIDEBOOK at home and start exploring Rome just following your instinct. It is the best way. Now enjoy and Buon Ferragosto a tutti!! 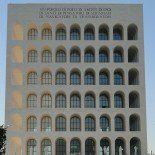 This entry was posted on August 15, 2016 by Salambo in Arts and culture, Contemporary Rome and tagged ferragosto, italy, Rome, visiting Rome.